Just think of the potential game designs waiting in that pile! Before we get started I want to make one point clear: This article is not about standard dice or even RPG dice. You can find standard d6s and RPG dice at your favorite local game store. If you want standard dice visit your local store or local thrift store. Or if you want really nice standard dice then check out Chessex. This article is about where to find blank dice, or special dice, or even dice that you can write on! And my disclaimer: I have not used dice in any of my game designs. While I know where to buy dice, I cannot speak to their quality, feel, or character. They are just waiting for your awesome design! 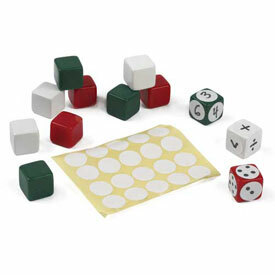 When it comes to using blank dice for game design, look no further than Indented Blank Dice! These are six sided dice with indented sides. Why indented sides? The sides are indented so that when you put a sticker on the side it won’t rub off or cause irregular rolls. Those prices seem a little expensive to me, but if you’ve designed the next Kingsburg, Alien Frontiers, or Macao, then you can probably justify the cost. 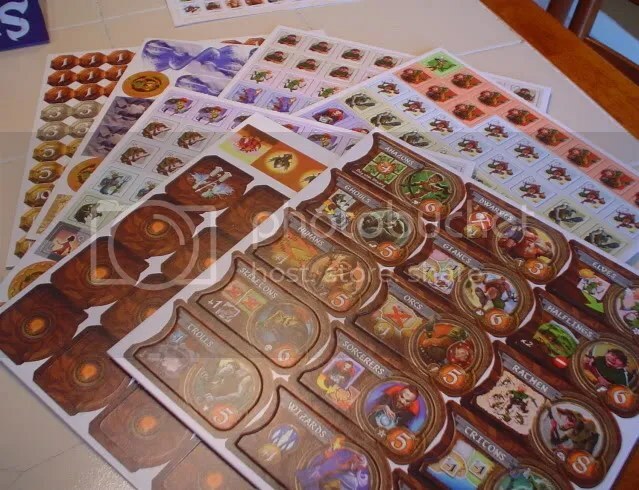 Each sheet of labels that they sell will handle 36 dice. Two sheets will cost your $6. They look similar to Indented Blank Dice, but they’re from Europe! If you are a friend from across the pond, i.e., from Europe, then perhaps your first stop should be BlankDice.co.uk! But here’s the kicker… If you were to purchase 25 of these at £0.20 each (to compare the pricing against the source above this one) you would find that it would cost roughly US$15.50 to ship to the US. That’s only $0.50 more than the above source. 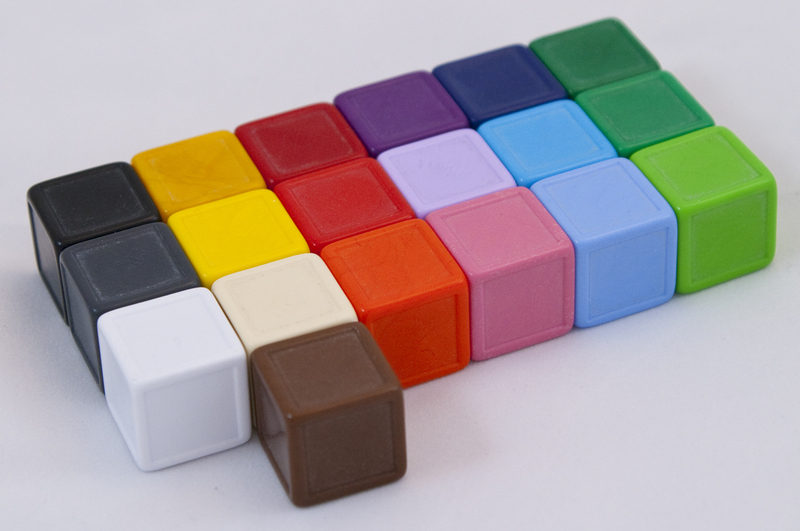 So if BlankDice.co.uk has a color that you desperately need, then maybe you could order from them instead. 16mm Stickerable Blank Dice: $0.15 ea. 19mm Indented Blank Dice: $0.50 ea. Stickerable Polyhedral dice (d8, d10, d12): $0.99 ea. 16mm Translucent Dice (Red, Green, or Blue): $0.45 ea. Side Note: I personally met the guy behind Print & Play productions at GenCon and I can safely say he’s an awesome guy. I would definitely feel confident when purchasing from him. And the fact that you can order basically all of the components you would need for your prototype from one source makes Print & Play pretty awesome! The EAI Education catalog is a fantastic one-stop-shop for game designers. You can order cards, dices, cubes, and more all from their online catalog at excellent prices! And if you need standard dice to compliment your game design, then you can believe that EAI carries what you need! The guys at The Game Crafter also offer black indented dice. If you choose “dice” from their parts selection you’ll get a bunch of standard dice as well as blank dice. They offer 8 different colors at $0.40 each, though if you order more than 9 of any color the price will drop to $0.38 each. These prices are better than some of the other sources listed above for indented blank dice. But as I mentioned when writing about TGC for the Meeples article, if you are ordering components like these you still have to wait in their production queue. Since I live in the Madison area I think I should volunteer my time to fulfill component-only orders with no customization of cards or boxes or rules. That way, if you order stocked components only, the order would skip the custom production queue and be able to be mailed to you much more quickly. This isn’t a huge complaint and it doesn’t hold me back from ordering from TGC. It’s just something I think they could do a little better. So perhaps Amazon will be your go-to source for dice. And there you have it, folks! This is the conclusion of my series on sourcing game components. You should now know where to find all of the components you need. Thanks for reading along during this series. It has prompted me to desire a large order of components from all these different sources. I’d love to simply stock up on tons of stuff so that I can have the world of game components at my finger tips in case inspiration strikes! Good luck game designers! Unpunched chits from Small World. First, a disclaimer: There is nothing quite like that fresh new board game smell when you pull off the shrink wrap and open a game for the first time. Then you have the awesome moment of getting to punch out the chits and that really makes you feel special. I love that! Today, however, we are not talking about unpunched chits, but rather blank chits that you can use for prototyping your game design. These include circles, squares, hexes, and more. On their page you can purchase triangles, hexagons, squares, rectangles, diamonds, circles, and more. They seem like an excellent option for purchasing chits. One of the nice things about Print & Play productions is that if you order the hex tiles, you’ll also receive the little rhombuses that were in between the tiles. And those could potentially be useful in a future game design! Available to you are triangles, circles, squares, rectangles, and hexes. They don’t have nearly the variety of SpielMaterial or Print & Play Productions. And you have to deal with the lead-time issue. But it sure is convenient if you can order all of your components from the same source. They only offer 2″ hexes, 1″ squares, and 5/8″ squares. So it’s pretty limited, but it appears that they might be mailed to you unpunched, which is sweet. So there you go. I know this is a short list, but I think that’s because there just are not very many sources for board game tiles like these. If you know of other sources that have quality components available, please let me know and I’ll add them to this list. Thanks for checking this out. I hope it helps you as you build your game prototypes! Yesterday I posted a gallery with 40 pictures from GenCon. 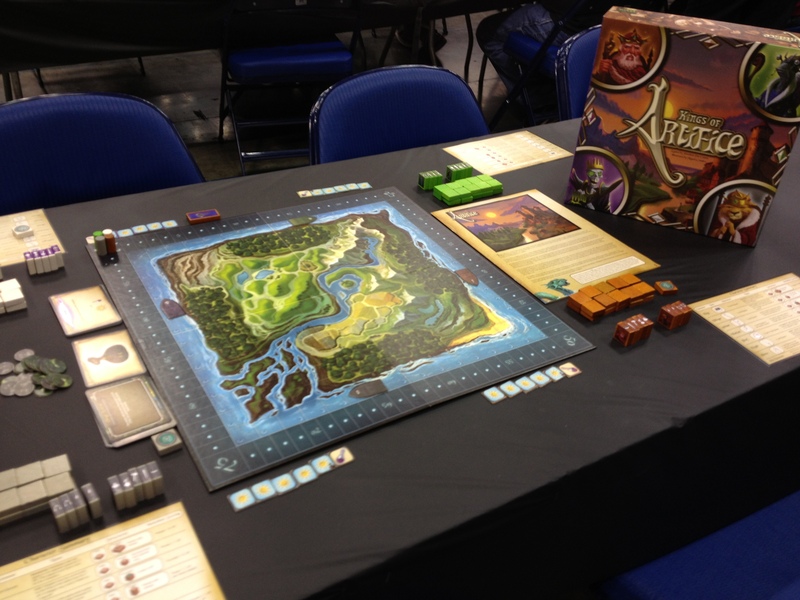 Today I am giving a more prose-y account of my experiences at GenCon. But with having only 15 hours of sleep total during GenCon I may not remember all the details. So bear with me as I blab through this. When the calendar flipped from 2012 to 2013 I made a list of goals for the year. One of those goals proclaimed this year the “Year of Manliness,” which we won’t get into here. 🙂 Another goal was to design and playtest Scoville so that it was ready to pitch at GenCon. 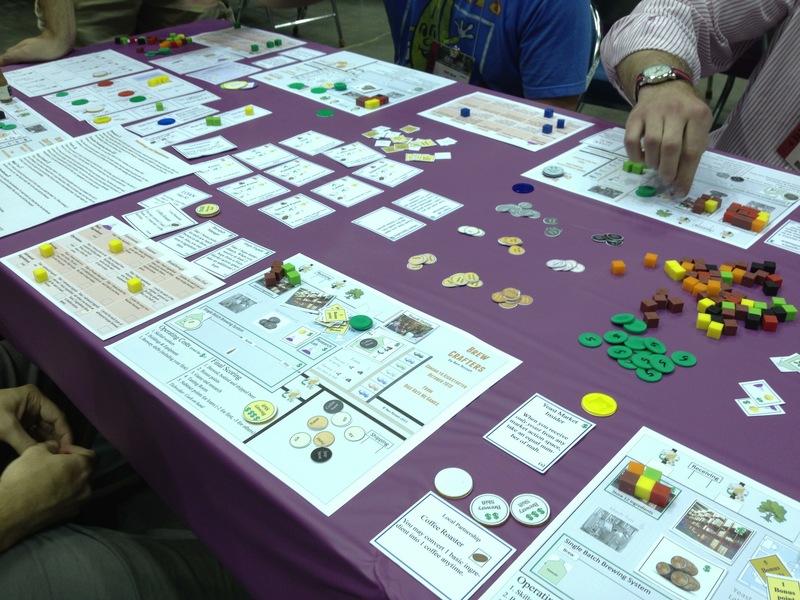 If you follow this blog at all then you likely know that I didn’t have to pitch Scoville last week at GenCon since it was already picked up by Tasty Minstrel Games. Yay! So I figured I could try and get another game ready to pitch for GenCon. But that didn’t happen. Games don’t just develop themselves. While I brought a copy of Trading Post and a copy of Conclave, neither were to the point where I felt comfortable putting them on the table with other people besides myself. I showed Conclave to a few people who seemed to like the concept. But the bottom line was that since Scoville was signed and I had nothing else to show I was basically free of stress at GenCon 2013. So my approach was to cultivate, enhance, and develop professional relationships with designers and publishers. Basically I just wanted to meet as many people as possible. That’s a pretty nice approach to be able to take. I always have to keep in mind that while board games and board game design are my hobby, they are the real-life day to day jobs of a lot of the publishing companies. It’s easy for me to just go up to them and joke around and have fun, but I have to remember that these are professional relationships and I should try to treat it as such. So don’t act like a jerk and do stupid stuff since these are the people that you could be working with in the future. I brought along the business cards that I had made for Protospiel-Milwaukee. I think I handed out about 30 of those over the course of the convention. I also was able to gather a few business cards from other people. I’ve gained a few new Twitter followers as well, which is always great. So overall I’m pretty happy with the business relationships that I formed. On the road to GenCon! Our 5 person cadre hit the road from Madison around 5am. That felt really early, but we powered through and it felt great to be hanging out on the way to GenCon. Our drive had a few highlights, and thankfully no lowlights. Along the way we made two pit stops. 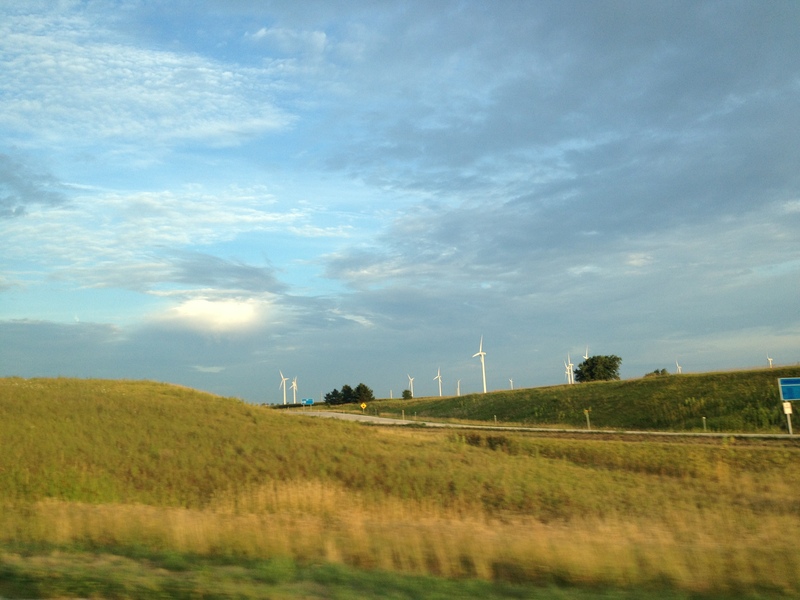 The first was in the beautiful small town of Tonica, Illinois. Unforunately we had to drive like two or three miles off the freeway just to find the gas station. But at least when we found it, it lived up to the expectations of a small town gas station in Illinois. At the second gas station we stopped at we were pleased to see 10 police cars with cops surrounding a car at a gas pump. We weren’t sure if we were safe, but we gawked for a while anyway. But let’s keep going with this recap. On the road we played one scenario of Sherlock Holmes: Consulting Detective. I had not played a game like this before but I really enjoyed it. It’s basically a thinky game where people talk through the scenario and try to figure out the Who-Dun-It type thing. We ultimately got the answers right, but we used way more leads than Sherlock did. Another thing we did during the ride was design a game together. We even pitched it to a publisher later in the con, but I don’t think we were able to really portray the potential of the game. These are all the details I can give, but I think this game has a lot of potential. We rolled into Indy around lunch time and headed to a restaurant called Yats. Ben had spoken so highly of it last year that we figured we should start our GenCon with it this year. It was delicious. Then we hit the hotel and then hopped in line for our GenCon passes in Will Call. The excitement was abundant! To the exhibit hall we went, ready to buy games and meet people! The first person I met was Ken Grazier of Geek-Craft.com. He had made some Scoville buttons for me and so I traded a small amount of cash for them. They turned out great and I’m thankful to Ken for his button making prowess. Then we headed to a few specific booths to try and snag some stuff. Thursday isn’t our main exhibit hall day, so we jumped from booth to booth. An obvious stop for me was the Tasty Minstrel Games booth. I connected with the TMG guys and met the awesome Brian Frahm, who was demoing Dungeon Roll a ton over the convention. Brian is a great guy and it was a pleasure to meet him. First Day Haul at GenCon! In the picture it should be noted that League of Six was obtained via trade. Then we headed to our hotel room to unwind a bit and decided to head to the bar for a game. We played The Little Prince, which I’ll be reviewing on Friday. Then we headed to dinner where we got in a game of Love Letter. As for the Barley side of things Thursday included a sample of the GenCon brew “Flagon Slayer,” a Rock Bottom Honey Ale, and the brown ale at the JW Marriott. Friday is our main Exhibit hall day. On the way to the exhibit hall we noticed a game called Kings of Artifice that none of us had heard of. This was being demoed in Hall C (I think) by the publishing company called Wyrd Games. It had an interesting mechanic of summoning people onto the land and using them to the best advantage. You could be conservative and focus on building your little part of a kingdom, or you could be aggressive and try to wipe out your opponents. It seemed like an interesting game but wasn’t something our group ended up buying. While we were demoing I received a message from the honorable Matt Worden. 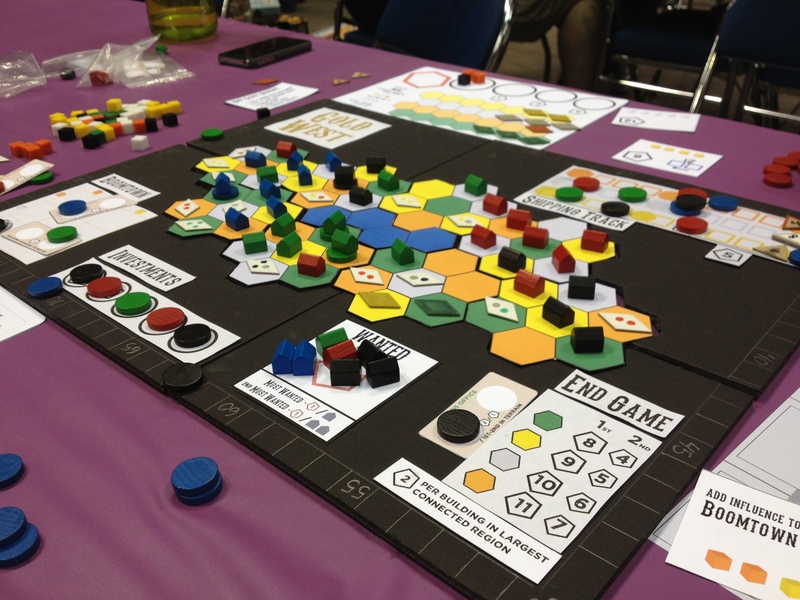 It was an invitation to speak in a panel discussion on Protospiel. My awesome friends had no reservations about me going to partake in the panel. So I went over to the Crowne Plaza and joined some esteemed designers for the panel discussion. That was the awesome part. The downside was that there were only six attenders. We had as many people on the panel as there were people attending the panel. Apparently they had 45 attenders last year. I think that since it was in the Crowne Plaza, people weren’t willing to leave the convention center to come over and attend. But I was honored that Matt would invite me to come speak on the panel. Thanks Matt! The other downside was that I was really looking forward to walking through the exhibit hall. I figured my guys were already halfway through it. But when I came back and found them in Hall D playing a game I was greatly pleased that they had not yet gone into the hall. They chose to play a game and wait for me instead. That was awesome! So we started walking aisle by aisle through the hall. It’s such an experience to do that. If you’ve never been to GenCon it’s hard to understand the massiveness of the exhibit hall. We bought a few more games before three of the five of us headed out for a talk on Evil Villains by author Brandon Sanderson. One of the fun things about the exhibit hall is sitting down and trying games. One of my favorite games to play was Weykick. It’s basically a magnetic take on air hockey, but it’s very enjoyable. I got owned by Jeremy. We also tried Crokinole, which is a game we’d like to build for ourselves. It’s a fun flicking game on a big round wooden board. We finished in the hall in time to grab some food at Chick-Fil-A in the mall before a demo. We successfully avoided the two hour lines at the food trucks this year! Lunch in hand, we joined up with our guys at a demo for Dice Hate Me Games‘ upcoming game Brew Crafters by designer Ben Rosset. I’d go into a review of the game but I might save that for a session report on BGG. The bottom line is that this is a great game, and not simply because it is a perfect fit for Boards & Barley! It worked really well, the decisions in the game all seemed important and made sense, the theme was awesome, and, most importantly, it was a lot of fun! I’m looking forward to seeing this one on Kickstarter! Ben is a very nice guy and it was a pleasure to meet him. Check out his other game, Mars Needs Mechanics, available from Nevermore Games. After that we went to the Rathskellar for an awesome time in the beer garden. There were German beers on tap, pretzels to consume, and a plate of sausage that tasted delicious. On top of there there was a really good band that had a great sound. Hanging in the beer garden was one of the highlights of GenCon 2013. Late that night we headed back to Hall D with a latte. I had the pleasure of teaching Scoville to several new players. It seemed well received and I was happy to give away some of the buttons. It was also cool to have two simultaneous games running. At the same time we were able to chat with Michael Mindes, owner of Tasty Minstrel Games. I also had the privilege to meet Rob Lundy, artist/graphic designer for Dungeon Roll. He’s a home brewer, too! After all was said and done I rolled/slumped into bed around 3:30am. I’ve been told that’s typical of GenConners. And Friday’s Barley choices included two (large) Spaten Optimators. Saturday is our last day of GenCon since we normally depart early Sunday morning. We started things off with a demo of Rialto by Stefan Feld. I had already picked it up from the Tasty Minstrel booth because of the great price ($30). It was nice to have someone teach us the game though. It was an enjoyable play and the game seems like a nice lightish Feld game. I was happy to have picked it up. We then wandered the hall a little more to make sure we didn’t miss anything and to pick up a few other things. I snagged Targi for $20 which seemed like a good find. Then we had lunch and made our way to the GenCon Library room. In the Library we had scheduled a demo of Francis Drake by Eagle/Gryphon Games. I was a little hesitant about trying this out because it seemed primed to be a 3 hour dry and boring Euro. Boy was I wrong. This game was really fun. There is a nice resource procurement track that worked really well. After goods are obtained you then ship off for a trip to central America where you can pick up trade goods, battle against villages and forts, and attempt to battle another ship. This game was very solid and was really enjoyable. I was very surprised by how fun it was and how not-dry or boring it was. After dinner at Rock Bottom we made our way to Hall D again where we got in a game of Flick Wars coming soon by Andrew Tullsen and Print & Play Productions. I personally enjoy flicking games like Bisikle, Crokinole, and others. This was also a fun flicking game. I believe Andrew will be putting it on Kickstarter in the near future. We also got to play Lagoon by David Chott, which should be coming to Kickstarter by his company, 3 Hares Games. While the fantasy theme wasn’t really my thing, the gameplay was very interesting and enjoyable. There are some really interesting combos you can do in the game, which make the decisions really awesome. There is a nice balance of trying to aim for combos to set something up for a future turn versus simply trying to score a tile on the present turn. I think this game was well done and I wish David the best with it. After that I was fortunate to have a few more players for Scoville. And I was able to sit down for the game as well. It went well and I heard something that really humbled me. One of the players said after the play that it’s in his top ten games. That was amazing. The night ended with a play of Alex Kevern‘s Gold West prototype. And I had the privilege of playing it with him, Ben Pinchback (Co-Designer of the award winning game Fleet, currently with an expansion on Kickstarter), and the honorable TC Petty III (Designer of the awesome game VivaJava). It was great to meet them and game with them. They are all outstanding people. Gold West is a great game. There is a really cool take on the Mancala mechanic that you really need to think about to maximize what you can do on your turns. In the game you are helping to develop a western town. You obtain metals and building materials that you have to figure out how best to use. Each turn you can place a building onto the territory and claim the goods from that piece of land. Once you have the goods, you need to place them into one of the Mancala spots on your player board. This is the tricky part of the game. On any given turn you can only use the resources that are placed into the last spot after taking a Mancala action. So you have to plan accordingly. This is a sweet use of the Mancala mechanic and made the decisions in the game very interesting. The other part of the game that I really enjoyed was how to use the resources once they are available. You can ship off the metals, use them to develop the boom town, or fulfill investments for big points. Each of these mechanics works really well together and I was happy to be able to play the game. It was fun and strategic while also being accessible and easy to teach. And it only took about 55 minutes for four players to finish the game. That’s awesome! The barley I consumed were a pair of Rock Bottom brews: Red Ale and Kolsch. My favorite unpublished games were Brew Crafters and Gold West. Those games are both games I would have bought at the convention if they were available. I’ll definitely be watching the development of both of them. My favorite published games (or soon to be released) were The Little Prince, Spyrium, and Francis Drake. These three games were my most enjoyable plays of the convention. I was really hoping to pick up Bruges at GenCon. But Z-Man games only brought a few copies and it was sold out after a half hour. That was well before we arrived on Thursday. That was really disappointing. The other disappointments had to do with prototype games that I didn’t have a chance to play. I really wanted to try Gyre by Eric Leath (and I’ll likely PNP it), VivaJava Dice by TC Petty III (but it was 3am by the time TC had a chance to show me), Belle of the Ball by Daniel Solis (I think Dice Hate Me had a copy available), and Pay Dirt by Tory Kniemann (designer of Alien Frontiers). Those are all games I had hoped to play but didn’t get the chance. Next year I think I’ll try and schedule more appointments with people so I can try out their games rather than simply trying to connect randomly. 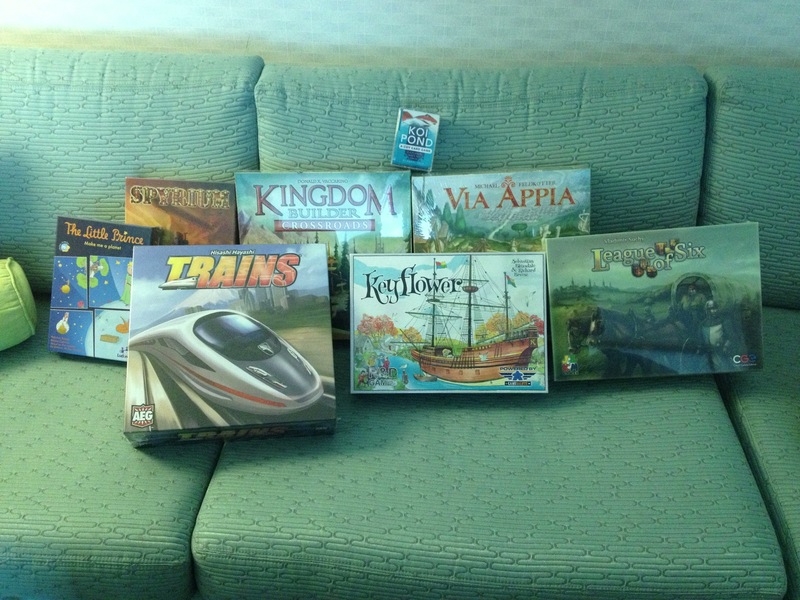 Overall, though, for these to be the big disappointments means that my 2013 GenCon experience was pretty awesome!